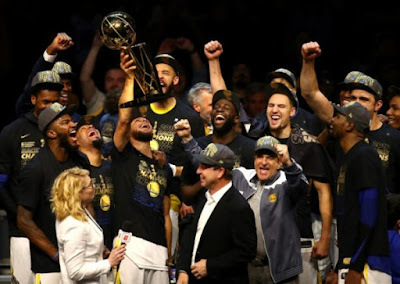 A dominant Golden State Warriors squad captured its third NBA crown in four seasons on Friday, routing Cleveland 108-85 to complete a sweep in the best-of-seven NBA Finals. Stephen Curry scored 37 points and Kevin Durant was named the NBA Finals Most Valuable Player for the second consecutive year after 20 points, 12 rebounds and 10 assists — his first finals triple double. “To win in a sweep, it feels pretty good,” Durant said. “Just knowing the work you put in paid off means something. The Warriors inflicted the first 4-0 NBA Finals blanking since the Cavaliers were swept by San Antonio in 2007. “It’s an unbelievable feeling to come here with a mission and get the job done,” Curry said. It was the fourth year in a row the Warriors and Cavaliers met in the finals, Golden State winning in 2015 and the past two years. “This is so hard to do and to do it three years out of four years is incredible,” Warriors guard Klay Thompson said. Golden State claimed the sixth crown in club history, matching the Chicago Bulls for third on the all-time list. The Warriors won in 1947 and 1956 when based in Philadelphia plus 1975, 13 years after their move to the San Francisco Bay area, and the latest run.